Emmanuel “Pierre” Ménager was born at Nantes, France in 1894 but emigrated to the United States, where he produced most of his work. Active in New Mexico, California and also New Orleans, Ménager was primarily a printmaker, though he also painted and sculpted. 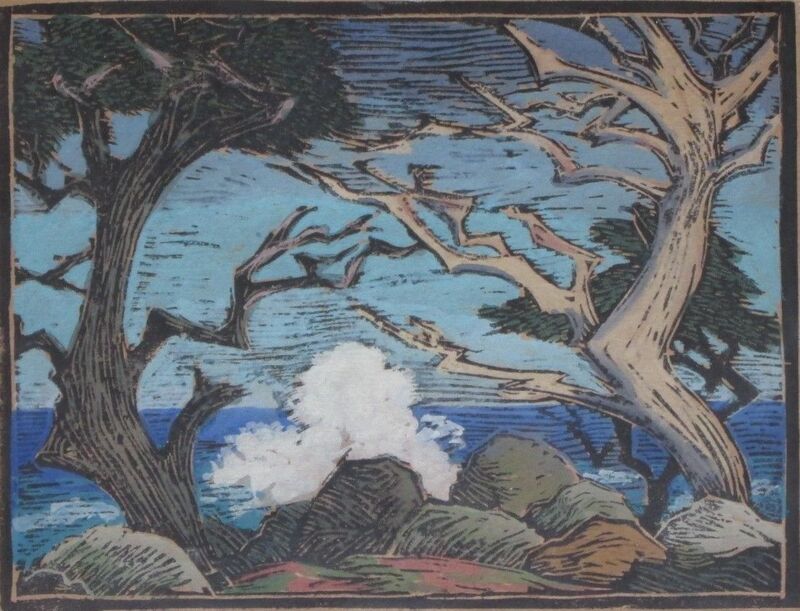 Whether this piece is a wood- or linocut is uncertain, but its colors exemplify a palette of the 1940s. He died at Hollywood, Florida in 1973. “Old Cypress Trees” was acquired from his estate. This is identified only as “block print” since it is unclear whether it is printed from wood or linoleum. In the summer of 1989, Richard and I trekked around Lake Michigan for a week or so. He flew to Minneapolis and then we drove counterclockwise, through Chicago—where there was a Wright exhibit at the Museum of Science & Industry, of all places—and then to Detroit, up the “mitt” to Mackinac, westward across the U.P. to Duluth, then down to MSP again. The third-point of the trip brought us to Muskegon, where there is a remarkable church by Marcel Breuer and a nifty 19th century rail station by Sidney J. Osgood (bet you never heard of him). 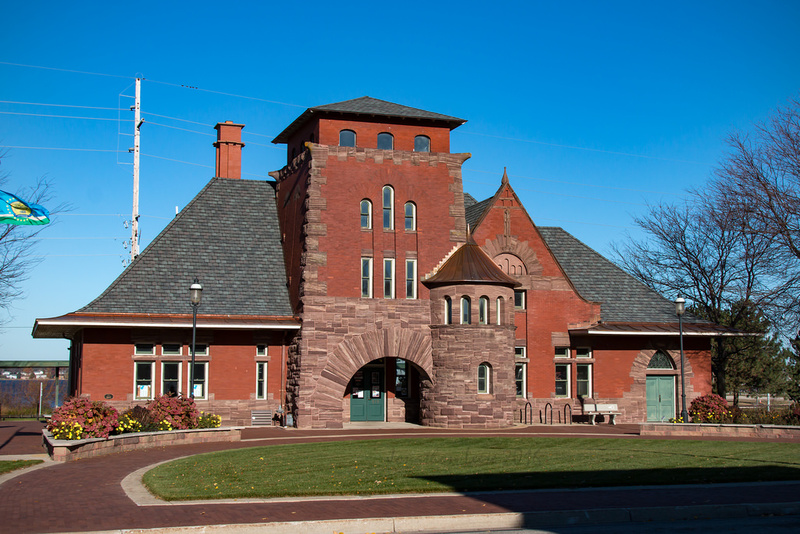 Muskegon probably has several greater claims to fame, but the Breuer church (St Francis de Sales; you should look it up) is what drew us there; the depot was a bonus. We separated at the depot (so as not to “clutter” each other’s photos) and as I walked away from the building to get context, I happend to glance down on the sidewalk. There was a small featherless bird, so far from any nest that I couldn’t imagine how it had got there. I momentarily wondered how I could save it, but we were “on the road”, stopping in motels, and I had no ready supply of ground worms. Then there was this voice, everywhere and, yet, nowhere, speaking: “Choose life!” it said. I still bear the guilt of walking away. I mention this, prompted by an article in the current Harper’s magazine: “The Sound of Madness: Can we treat psychosis by listening to the voices in our heads?” by T. M. Luhrmann. Psychology has evolved considerably since I was a youth—was I ever?—particularly on the question of psychosis. Luhrmann’s discussion centers on those of us who hear voices—as I did that afternoon in Michigan—and changing notions of schizophrenia. 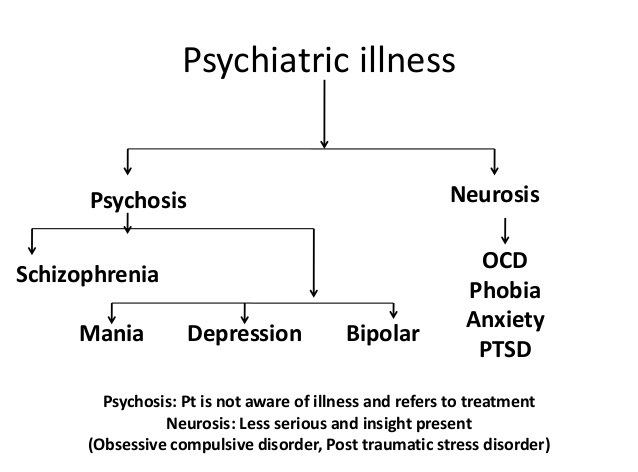 A current view holds that there is a psychotic continuum with “Virtually no two patients present[ing] the same constellation of symptoms”, and along with it “an understanding that voice hearing can shape the course and outcome of the illness.” But the sources and intent of the voices vary considerably. What they have in common is planting a thought that is not our own. Charismatics, for example, hear the voice of God counseling them to ignore other, demonic spirits. Others hear a committee of voices that variably criticize or counsel. One patient had been able to identify the angels and demons who spoke to him, managed to regulate their access, and had begun to like the “angels.” But one of those better voices suggested that his grandmother was a witch, whereupon he stabbed her at the kitchen table. “She bled to death on the floor.” Even Charles Dickens—this where it gets personal—revealed that he heard the voices of his characters, distinctly, and felt that he was simply transcribing what they said. So, here is where I find myself: readily accepting that thoughts can occur which we may attribute to an “outside” source; that they fall on a spectrum from madness to creativity; and that I’m waiting eagerly for their visitation on the Agincourt Project. If you’re out there—Pirandello’s “Six Characters in Search of an Author” and any others in need of an audience—come talk to me and let’s begin a conversation. The historic Occidental Mill ground Agincourt’s flour from 1860 well into the 1930s, and marketed the “Occidental” brand within a fifty mile radius. The mill was owned and operated by James and Kesiah Davison, early immigrants from Pennsylvania, and later with assistance from their sons Hiram, Isaac, and James Jr. When the mill ceased operation, it fell into picturesque disrepair until acquired and restored by the Fennimore Co. Historical Society and merged with the society’s other historic property, the adjacent Vakkerdal Farm and Creamery. Sixty-year-old James Davison Jr painted his family’s legacy in 1909, probably from the Milwaukee Road railroad bridge—although it seems more recollection than record. 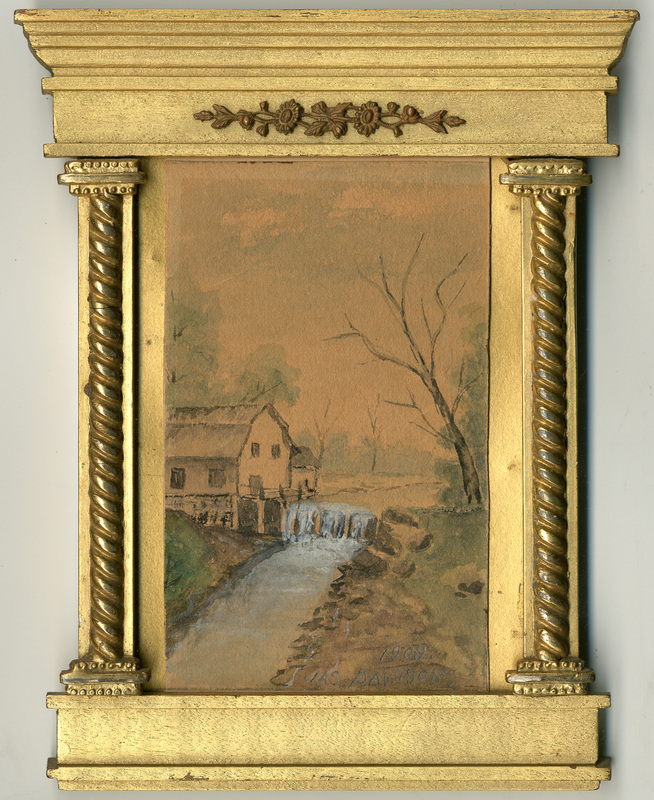 This watercolor and its delightful Neo-Classical frame were acquired from the James Davison III family now living at Plattsmouth, Nebraska. In the spirit of Sir Edward Elgar’s Op. 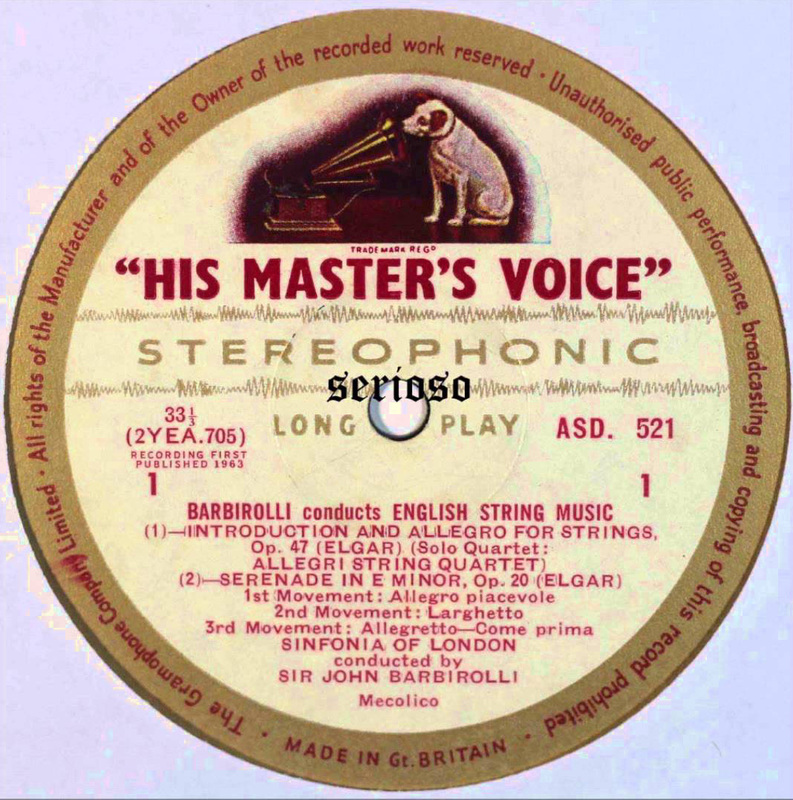 47, “Introduction and Allegro”, I wondered about the Agincourt Projects in musical terminology. British composer Sir William Walton, a full generation younger than Elgar, provided music for Agincourt’s Centennial celebration in 1957. And at that approximate time, he quipped about the writing of opera (of which he had produced just one, “Troilus & Cressida”): “Never write an opera,” Walton advised, “Too many notes. Too many notes.” Or some such admonition; I’m writing this from memory and you know how that goes. I might have echoed Sir William myself: “Never create a community. Too many stories. Too many stories. adverb & adjective: 1. (especially as a direction after a solo section) with all voices or instruments together. noun: 1. a passage to be performed with all voices or instruments together. Asked by of Sunday’s students how to choose a topic as their own contribution to the story thus far, it seemed best to approach the process of triage at some distance. consider, for example, the theme of the dying and the dead. Yes, any community of Agincourt’s size and aspiration would have had medical professionals and some sort of hospital. Ours has a curious name—Luke, the Physician—and has been relocated twice: first to the west edge of the city, and later, when a much larger facility was required, north of Hiway #7. Either of the earlier facilities would be do-able. adjective & adverb: 1. (especially as a direction) at a brisk tempo. noun: 1. a passage or movement in an allegro tempo. Depiction is problematic; to depict something is to freeze it in a moment of time, an arbitrary and artificial state. All parts of Agincourt have been in a constant state of “becoming”, but two of them at least offer a contained phenomenon: the county fairgrounds across the Muskrat and the cemeteries clustered at the opposite east edge of the city. To show either of them now entails their accumulated evolution from the 1860s to the present. Far better and easier, I suspect, would be a rendition of either in a previous phase. But I ahve yet to find volunteers to take them on. Perhaps the most “allegretic” of Agincourt’s parts might have been the city’s northern edge, where State Hiway #7 bypassed on its way westward toward Storm Lake. Grady Clay, journalist-turned-landscape-observer, has written what may be the most accessible resource for the study of urban change: Close-up: How to Read the American City (1974). Clay’s insight tells us that change is already afoot long before the physical evidence. This area would have been the location of the drive-in movie theater, new- and used-car dealerships, farm implements, and probably the first actual motel (as opposed to a “motor court”). such a study of The Strip could be a semester-long exercise, a potential candidate for ARCH 720-something or other. But I’ve resolved to never do one of those again. adjective: 1. relating to or characteristic of an elegy; “haunting and elegiac poems”. Synonyms: mournful, melancholic, melancholy, plaintive, sorrowful, sad, lamenting, doleful. noun: 1. verses in an elegiac meter. This is probably a more appropriate musical direction for either the cemeteries or the Square, Agincourt’s public assembly space opposite the courthouse; the testosterone-laden site of war memorials, etc. noun: 1. a contrapuntal composition in which a short melody or phrase (the subject) is introduced by one part and successively taken up by others and developed by interweaving the parts. 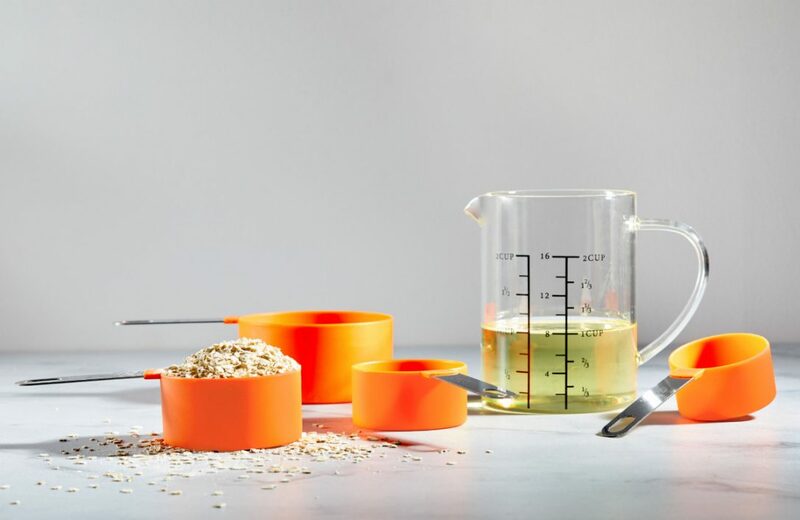 There have been moments, intense episodes of creativity, between and among some of us, when the energy is a genuine collaboration, each feeding on the other. Cecil Elliott once called this “heated agreement”, which might be counterpart to the musical notion of fugue. Musicians will be puzzled by these performance instructions (usually written in Italian). Confronted by Sir Lawrence Olivier concerning the score for Olivier’s film version of Hamlet, the sardonic William Walton added these words to his next film score, for Richard III: con prosciuto, agnello e confiture di fragiole. Unfamiliar with such direction, the conductor asked Walton their meaning and was not amused to find Walton intended the piece to be played “with ham, lamb and strawberry jam”. I’d taken these intentions to heart when I read them more than fifty years ago and offer them to you today. Do not take yourselves too seriously. Even the Great Influenza Pandemic of 1918 must have had its bittersweet moments of irony and heroic humor in the face of irresistible force. Italian painter Guido Mattuzzi was born in Trieste, a city many Italians actually believe is not in Italy. His status as a 20th century artist may account for the lack of biographical information (all of which is in Italian), yet there is circumstantial evidence Mattuzzi may have spent some time in Argentina, where there is a substantial community of Italian expatriates. 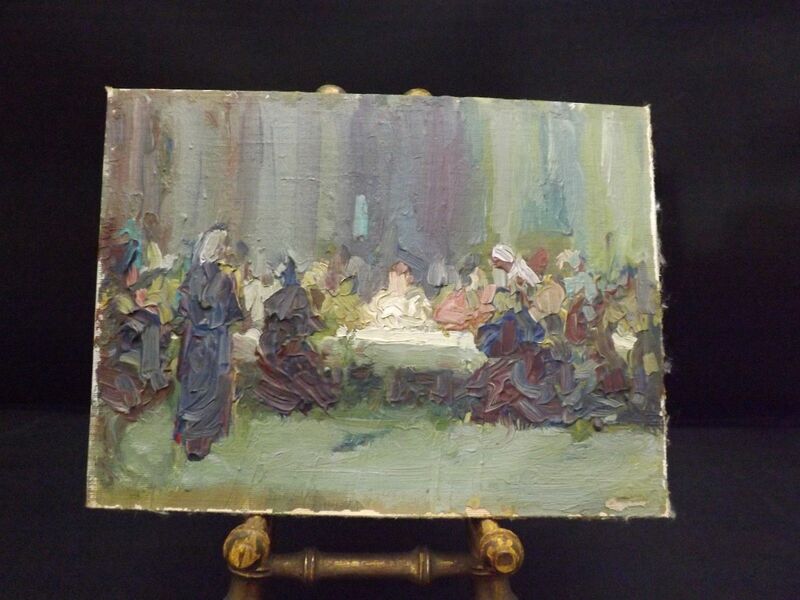 This small rendition of the Last Supper, in heavy impasto technique, may have been a study for a larger work. The painting came to the collection from the children of the former owners, who do not know its origin. Just when I suspect “Agincourt” has hit the wall, when the threads that have been in play for a long time seem to fray, a stray cosmic ray strikes home, a new path opens before me, an invitation. Who knows from whence such stimulation comes? I’ve ceased wondering — at least that sort of wondering; there’s plenty of wonder, a seemingly unending supply, still in me. And when that is gone, there will be no easy answer. The idea of Mesopotamia, a land framed by rivers, opens several interesting trains of thought. The origin of the name itself. The likely ethnic and/or racial makeup of the neighborhood. [Will resolving that question make me a racist? And if I have to ask, am I one already?] And what sort of society will those folks evolve in their own best interests? My own lower Middle Class origins may taint any story emerging here that defines the Mesopotamian experience, especially as it differs from Agincourt’s other neighborhoods. It poses a broad question: “What constitutes the Good Life?” and, by extension, what are its metrics? Armed with these as a frame of reference, defining the core values of Mesopotamia won’t be much easier, but it will be more rewarding. Little is known of Cornish artist Demelza Donald, other than her given name, which places her origins squarely in the southwest of England. Donald was likely a student in the post-WWI years at the Newlyn School, an artists colony at that fishing village adjacent to Penzance (made famous by Gilbert & Sullivan). Newlyn attracted artists for its mild climate, high proportion of sunny days, and picturesque coastline, countryside, and surviving instances of British folk life. 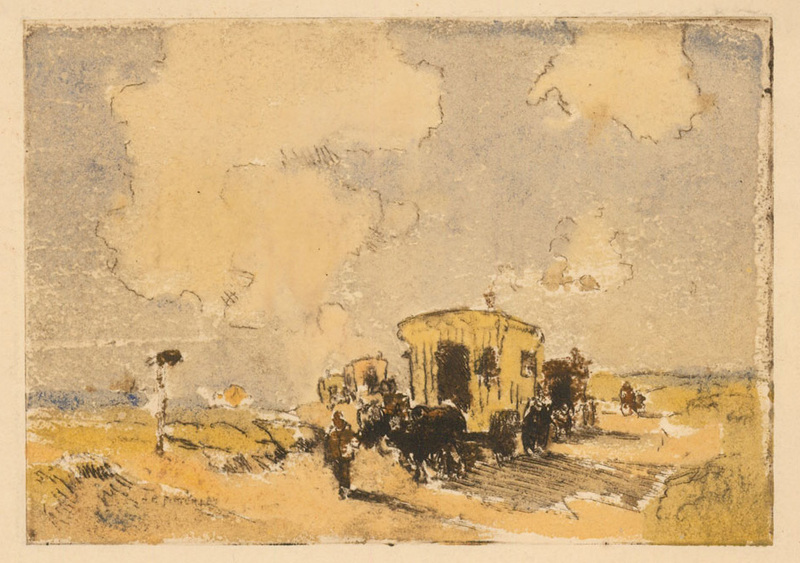 Donald’s small aquatint depicts—we believe, based on photographic parallels—a caravan of Romany or Gypsies moving across the dunes; such sights were still commonplace in Britain well into the 20th century, attested by this photograph taken in April 1929 of an encampment at Epsom, in far-south suburban London. 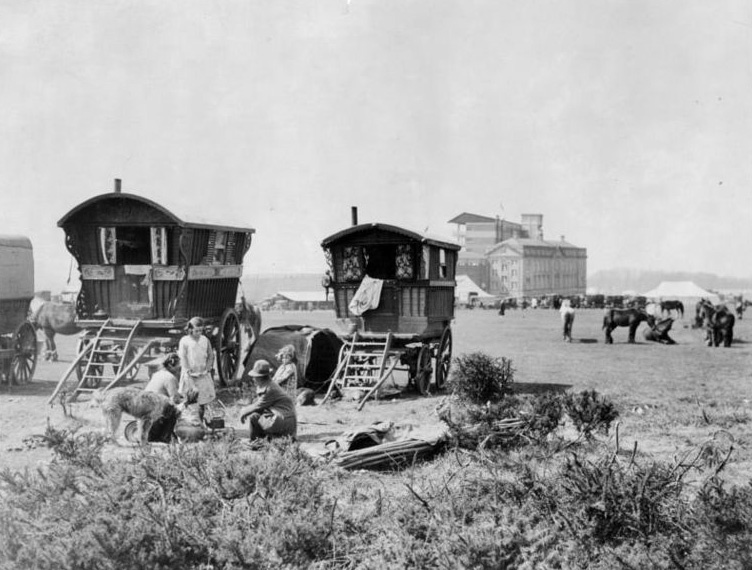 Gypsy encampment at Epsom, Surrey (April 1929). The tall structure in the distance is the Epsom Downs Racecourse. Donald’s name appears in the British census of 1921 (listed as “spinster”), though it is absent from surviving records of the Newlyn colony.